In this photo released by the Ministry of Communications and Information of Singapore, North Korean leader Kim Jong Un is greeted by Singapore Minister for Foreign Affairs Dr Vivian Balakrishnan at the Changi International Airport, June 10, 2018. Kim Jong Un on Sunday strayed further from his North Korean home than he has at any other time since taking power in 2011. The North Korean leader arrived in Singapore midday Sunday, flying on a Chinese jet to the Changi Airport. Kim on Tuesday is set to meet U.S. President Donald Trump in a historic summit that Trump has called a “one-time shot” at peace. The media did not catch a glimpse of Kim as he was escorted in a black, Mercedes-Benz limousine — with darkly tinted blackout windows — from the airport to the luxurious St. Regis Hotel. 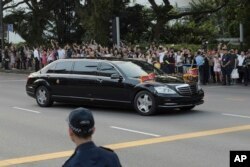 The limousine of Kim Jong Un arrives at the Istana, or Presidential Palace, in Singapore on June 10, 2018, to meet Singapore Prime Minister Lee Hsien Loong ahead the summit between U.S. leader Donald Trump and North Korea leader Kim. Tourists and hordes of international media, who have come to Singapore to cover the summit, pointed cameras, smiled, and waved at the motorcade, which was flanked by a group of trim North Korean bodyguards running alongside. Later, Kim appeared confident and grinned widely for the cameras as he shook hands with Singapore’s prime minister, Lee Hsien Loong, at the Istana Palace. Trump, who arrived in Singapore just hours after Kim, will meet with Prime Minister Lee on Monday. Singapore is seen as neutral ground for the summit — the first ever between a North Korean leader and a sitting U.S. president. The Singapore summit offers the world an unprecedented look at Kim, a reclusive leader in his early 30s, who until recently hadn’t traveled outside his country since taking office. In recent weeks he has twice traveled to China to plan for the U.S. summit. Kim, who presides over a totalitarian government accused of some of the world’s worst human rights abuses, is reported to be concerned about his personal safety straying so far from home. Kim flew to Singapore in an Air China 747. His method of transportation to the summit had been the subject of speculation by analysts, who noted Kim may not have planes capable of flying from Pyongyang to Singapore uninterrupted. It is not clear what Kim and Trump are prepared to offer at the summit, or whether the meeting will result in a deal to eliminate North Korea’s nuclear weapons.